In the Meantime...: praising God for what's to come. So last week I went to this worship conference. It was a high impact kind of week. There were in depth sessions about worship, leadership, personal worship, and the theology of all those aforementioned. All that, plus some deep worship experiences that were, dare I say, out of the box for me. Even though the group in leadership was of a Christian perspective that was quite different than my own in both theology and practice, I must say that I learned quite a lot. And oddly enough, worship taught me some things about life and faith and who God is for us. This week I learned that the word "praise" in the Old Testament actually equals 7 different words in Hebrew. Each Hebrew word denotes a specific way to bring praise to God. Google it if you're interested. There are lots of websites about it. I must admit that there are some ways to praise that were a bit outside of my comfort zone. SHABACH praise is giving a loud shout. BARAK is to "kneel down in adoration" or "to bless." ZAMAR and HALLAL are probably my favorites. ZAMAR is praising with an instrument and HALLAL (the root of Hallelujah) is an overflow of joy in Lord, which is about the equivalent of a "happy dance." :-) Cool, right? The one that really caught my attention, though, was Towdah. TOWDAH means an extension of the hands (which you'd find is also the word YADAH), but with a specific purpose. This is extending the hands in acceptance and thanksgiving to God for what is to come. It is praising God for "things not yet received." Jeremiah 30:19 is one of the passages marked by this kind of praise. Isn't that beautiful? TOWDAH is the trust and confidence to believe God when He says He's working for our good and expressing that in praise. I was thinking about this I realized that this concept is all over in Scripture. Philippians 4:6 says: "Do not be anxious about anything, but in every situation, by prayer and petition, with thanksgiving, present your requests to God." I don't know about you, but the things I'm usually anxious about are unknowns. The most common unknown? Our future. God says, "don't be anxious...talk to me about it." And because we trust in His goodness, we praise God for how He is going to answer our prayer. Matthew 6 is ALL about worry. Again, worrying about the future. God says we're worth more than birds and they get taken care of. After all, God didn't send is Beloved Son to save birds. Praise Him for His provision both for now and in the future. It made me think of a day back in my Captive Free days. 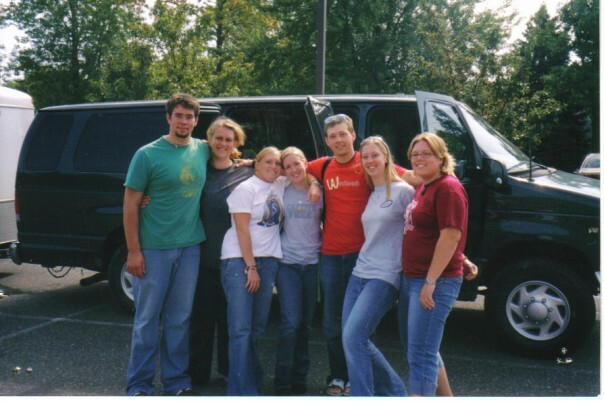 I was serving on this youth ministry team that put 7 people in a van for 12 months covering the Northeast region of the US. We were a band that played at churches, youth events, VBS, etc and we stayed with host families every night lined up by the churches or organizations hosting us. We were completely at the mercy (or maybe grace would be a better word here) of our hosts when it came to where we would be sleeping or what we would be eating. I remember a very specific day sitting in the van on a long driving day. In hour 4 of 8 for the day, it hit me. I don't know where I'm going to sleep tonight. I don't know the name of the church or most of the time even the city that we'll be in. I don't know what I'll be eating tonight or tomorrow or the next day. I do know, though, that all will be provided and it'll work out. It was odd how much comfort I was able to take in that moment of such huge unknown. It was my life. And in that moment, I praised God. I TOWDAH'ed God for what He had provided and how He would provide in the future, knowing His outrageous love for me and my team. I am speechless as I relive that moment. God, I'm waiting. But right now, I TOWDAH You for the wondrous ways You've loved and provided in the past and the unfathomable things You have in store. I can't wait to see You say "Tah-Daahhh" as you continue to surprise us with blessings. In the meantime, I'm saying TOWDAH.